Real estate sales in Ottawa for the past 5 or 6 years have been following a consistent pattern. Freehold (* see footnote) home sales were fairly flat, while prices of these single family homes would rise and fall seasonally, with slight increases year over year. Condo sales were sluggish and prices were bumpy overall, with apartment condos falling a few points on average each year. Many people who purchased new construction condos since 2010 and re-sold them prior to 2016 sold them at prices significantly lower than the original purchase price. This year has been a different story. It began last year, but 2017 has from the beginning been determined to set itself apart. Home (i.e. freehold) and condo sales are both up, the number of homes and condos for sale is down, and freehold prices are significantly up. Condo prices have stabilized. Let’s look at some statistics for the first 75% of the year (i.e. through the end of September) and look for signs of what might happen next. The first statistic of interest is the simplest one. The total number of properties sold this year to date is higher than ever. Last year broke the previous record on the strength of transactions recorded between August and December. 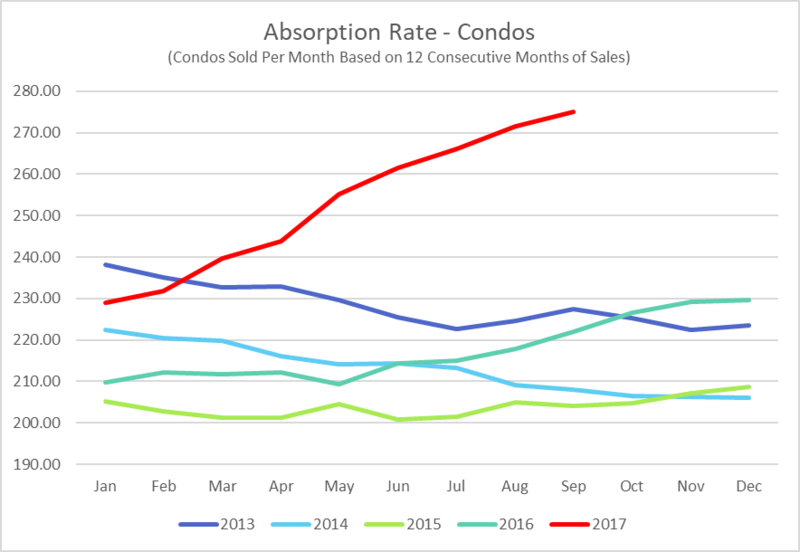 The orange line in the graph below represents combined sales of homes and condos in 2016. You can see that things started to slowly take off around June. By August the number of transactions was breaking away from what we saw the previous few years. 2017 (the red line) had a typical start, but began climbing in April and turned sharply upward in May and June. 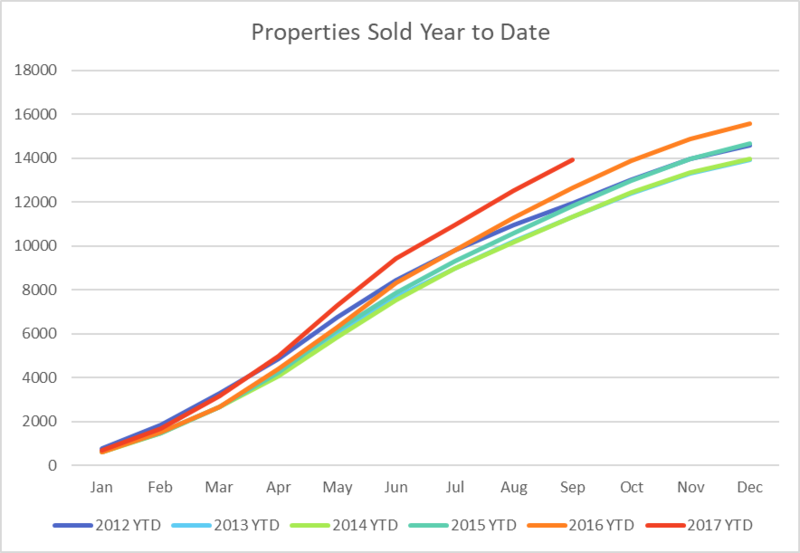 Sales in July, August, and September however, have not gained significantly more ground over last year. The next two graphs illustrate the momentum of the market for freehold homes and condos separately. 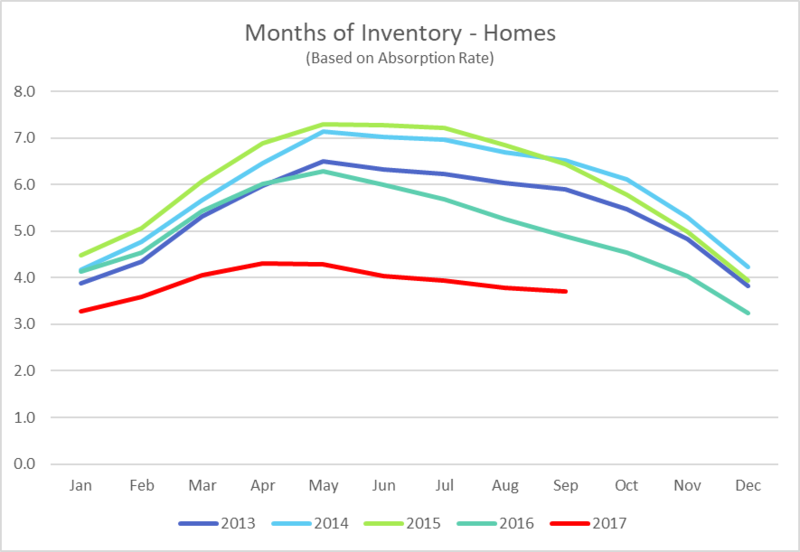 The difference between the “absorption rate” statistic and the above simple count of the number of properties sold, is that this one “normalizes” the pace of sales by looking at the average number of homes sold per month based on the most recent 12 months of sales. This has the effect of smoothing out the monthly and seasonal ups and downs of the market, to give a better sense of the market over time. Going back to 2013, sales of all categories of homes (freehold and condo) were sagging. 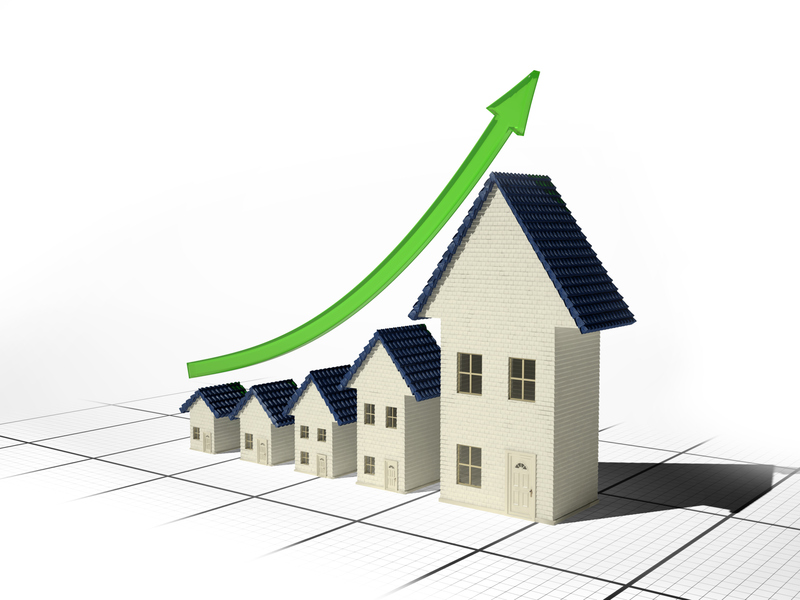 Freehold home sales remained flat through 2014 and then began to show clear signs of climbing through 2015. In hindsight, the freehold market was gaining momentum from about 2014 right through June of this year. At times the ramp up was quite steep (middle of 2016 and Spring of this year). The pace of condo sales has been very different from freehold homes. You’ve heard that in the news and if you’ve paid attention to or been involved in the market over the past few years, you have felt it. In 2012 through 2015 there were hundreds of condos sitting on the market while prices of those that managed to sell gradually slipped. As noted above, the worst situation to be in was trying to sell a condo that you bought brand new within the past few years. Many sold below original purchase price from the builder. All of that started to change half-way through 2016. Pent-up demand for condos after a few years of slow sales, combined with a lot fewer of them on the market (no doubt many owners who had been thinking of selling resigned themselves to hold onto their properties – either staying put or converting them to rentals and letting their tenants finish paying off the mortgage) caused sales to start heating up. Look at the enormous ramp up of condo sales that has continued this year, with no sign of slowing yet. The next two graphs take the absorption rate from the above graphs and show how long it would take to sell off all current listings at that pace of sales. The number of homes and condos on the market had been extremely high from 2010 through 2015, but with properties starting to sell faster and fewer people putting or keeping their properties on the market, we are now in technical seller’s market territory for freehold homes and rapidly headed there from balanced territory for condos. (** see footnote). I think it’s important to understand the graphs and statistics; to look carefully at the facts and assess the character of the current market as accurately as possible. People use the phrase “knowledge is power” but too often it’s just puffery, as in, “I’ve been in the business 20 years; put my experience to work for you; knowledge is power.” For my money, experience applying facts to make smart decisions in specific situations better exemplifies the phrase. What do the graphs of these key statistics mean? What do they tell us about the market and how should this guide your actions if you’re buying or selling a home or condo in Ottawa for home or investment purposes? That’s what matters. 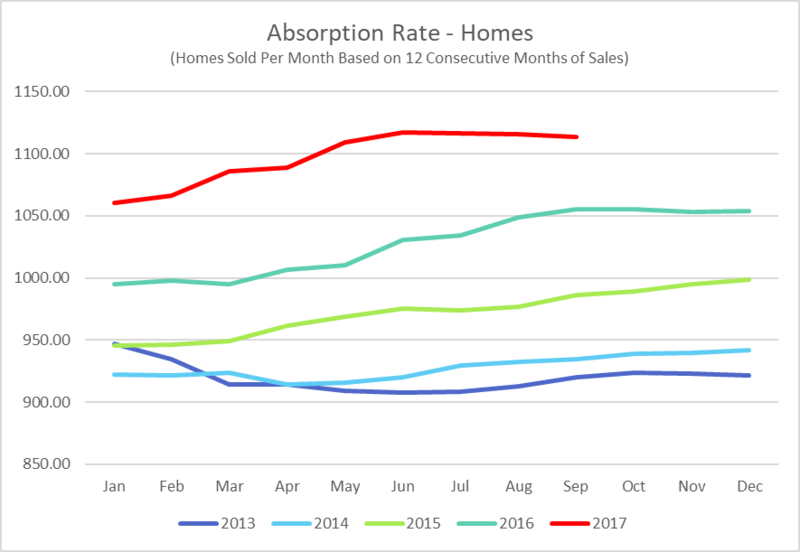 The absorption rate curve for homes, for example, explains why many buyers found themselves in competition when making an offer this year. But the curve has begun to flatten. It flattened last year at this time also, and therefore this may be a seasonal effect, or it could represent the beginning of the next turn in the market. What factors support each possibility? Rising interest rates might explain the surge this year and the market now starting to turn downward. Several of my clients are looking to purchase before their locked-in rates expire in November or December. Many other people bought this year for the same reason. Some of those clients say that while they prefer to buy before their rate expires, if they don’t find the right property or if competition makes each purchase attempt imprudent, they will wait until the right opportunity comes along, even if it means a higher rate at the time. Rates afterall are still historically low. 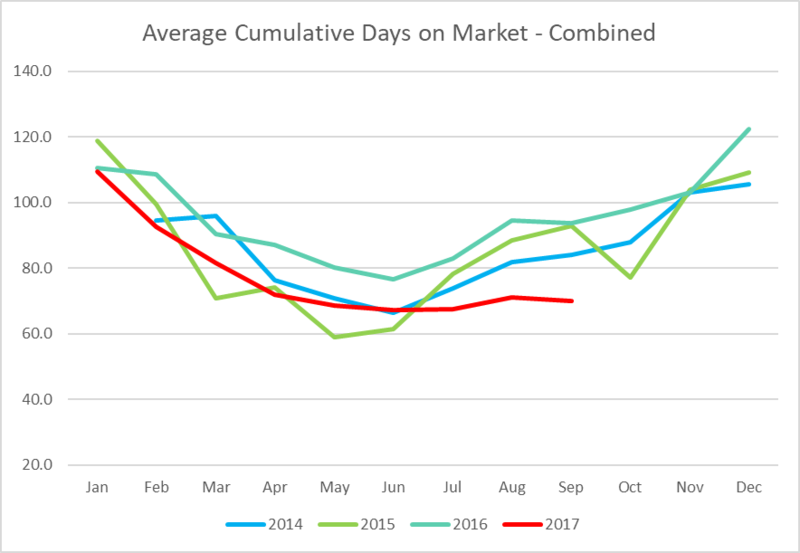 Five to six years of slower market conditions might suggest that pent-up demand will continue to drive the market higher and that the flattening is seasonal. Either way, now is not the time to bid way over the justifiable market value of a property, while it is a time to realise that you will likely have to move very quickly on any top notch home, and be prepared to pay full market value or a slight premium. 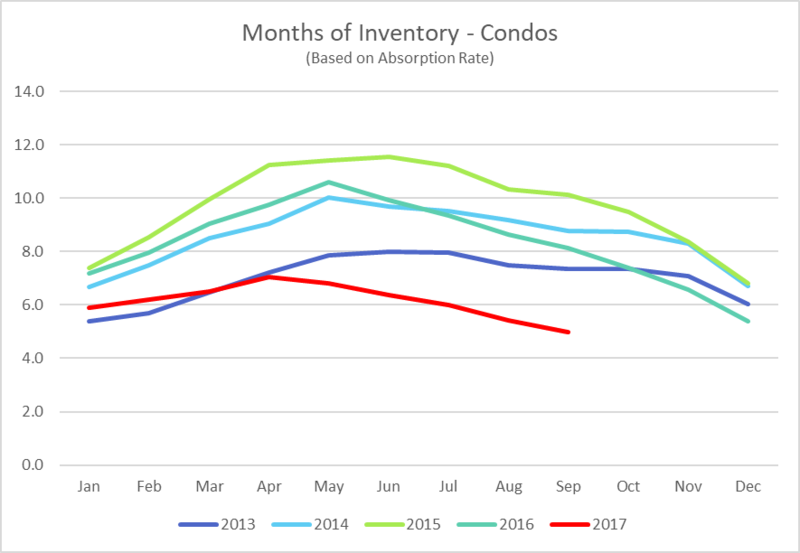 Condos have not quite moved into Seller’s territory yet, but the curve shows that conditions are rapidly heading in that direction. This is a situation that is not yet generating a lot of competing offers, but implies that this could start happening soon. There is still sufficient inventory to offer a reasonable amount of choice. Anyone thinking of buying a condo would be smarter to do so now than to wait for Spring. Of course, momentum could turn downward – we cannot predict the future – but with prices still fairly flat for condos and the strongest momentum we’ve seen in either segment for years, the downside risk of acting now is much lower than the risk of waiting. * Freehold Single Family Home : a freehold home designed for and legally permitted to house one family. This term is often mistakenly replaced by or confused with “detached home”. A single family home is not necessarily detached; it could be a townhouse, semi-detached houe, stacked townhouse, or an apartment. A “freehold” home in our context (Ottawa MLS-based home sale statistics) is any home that is not part of a condominium corporation.